What's NEW；Novel system was released as manufacturing system of emulsion film mask. 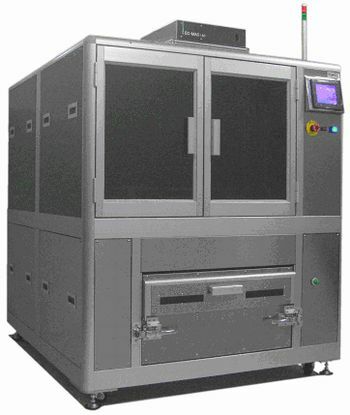 In this system, a film emulsion mask with high thermal expansion and contraction property can be converted into a LT (Low-Stretch) mask with low thermal expansion and contraction property same as the glass mask for mere 10 minutes. This mask equips same quality as the conventional glass mask in the manufacturing process of devices. Also, it's possible to reduce manufacturing system cost, material cost, and running cost (stock cost, banishment cost, and etc.) dramatically. 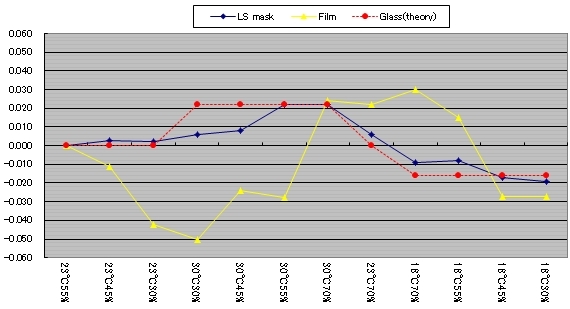 ■Film mask can be converted into a novel mask wtih thermal expansion and contraction property same as a glass mask. ■This mask can be manufactured by lower manufacturing cost compared to the conventional glass mask. ■A base glass substrate of LC mask can be used repeatedly because of possibility of recycle. ■While a base glass substrate is reused, it can be reused by making use of cleanser for household use and hot water. In short, an organic solvent is not necessary. ■There is only original adhesive as consumable goods. As a result, running cost can be reduced dramatically. ■You can operate this system easily because of easy operation based on touch panel, so that, hard and long training are unnecessary, too. 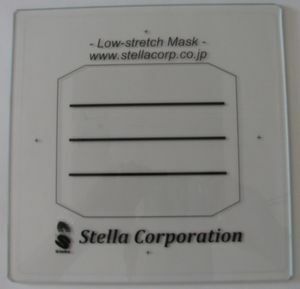 Picture shows a sample LC mask for an original plate of the screen mask use (for printing of electrode use). In short, you can use this mask as not only conventional mask for production of devices, but also original plate of the screen mask, too.